It's All About the Audio! Paul Kriegler hits the road for the It's All about the Audio Tour! You've heard about Omnia Processing. But have you HEARD Omnia Processing? You really have to hear it to believe it, so we're coming to you to let you experience firsthand why more top stations use Omnia than all other brands combined. 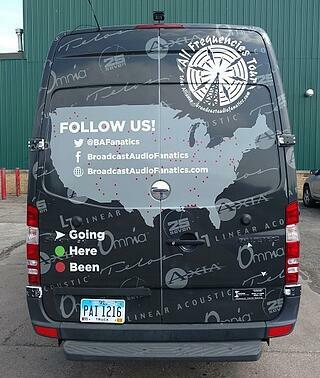 So we've brought the Broadcast Audio Fanatics van out of mothballs and we're taking it back out on the road! 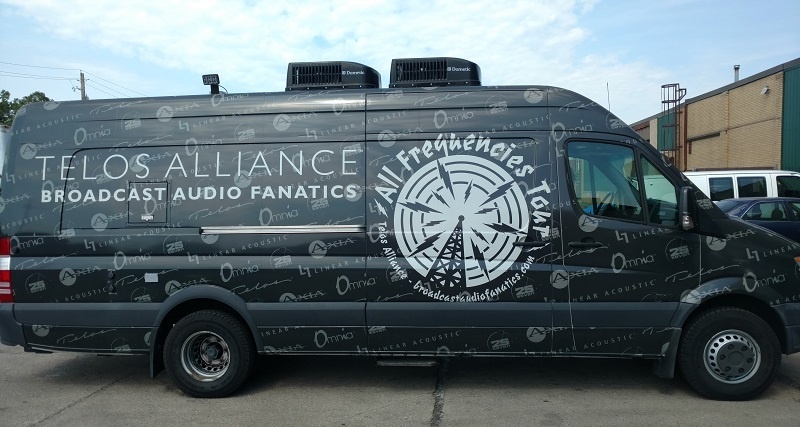 U.S. Omnia Sales Manager Paul Kriegler hits the highway July 10th with a sweet ride loaded with Omnia gear (if you don't see him coming, you'll be sure to hear him) for the All About the Audio Tour! Recently, I had the pleasure to have lunch with a good friend, Gary Katz. If that name sounds familiar, it should. Gary produced just about all of the albums for a little ol’ musical group you may know… Steely Dan! We were comparing notes about audio in the broadcast field, as well as life in the world of recording and music producing. He expressed how it has always been critical and vital for recording engineers, producers, and even the musicians to ‘hear’ the latest and greatest in technology. This is a practice that is still very common today. So, it got me thinking, even though Omnia is the far and away worldwide brand leader in broadcast audio processing, the same discipline applies. We need to be out on the street sharing the ‘sound’ of our offerings to the broadcast world. Just as we did twenty years ago, when Omnia.fm was born, we’re going back to our roots, and I’m excited about it!! We’re about to kick off a tour that will make all of this possible. Very soon, the Broadcast Fanatics will be back on the road, and there’s a good chance they may be either in your town, or somewhere nearby. We are equipping the van with Omnia processors, from various generations, so it’ll be possible to demo, test drive, and listen for yourself. We’ll even bring along a low power FM transmitter for you to compare Omnia to your own on-air signal, as well as ‘others’ up and down the dial. I can say - WITHOUT A DOUBT - when someone has the opportunity to hear Omnia processors, and compare them to ANYTHING, our sonic benefit stands out. Please don’t take my word for it, as my desire is for YOU to hear this yourself. It’s simple really, as IT’S ALL ABOUT THE AUDIO!! Nothing more, nothing less! Hearing is believing, especially today, when the marketplace is so crowded with wild claims, catch phrases, etch-a-sketch graphics, too many processing bands, and Xponential rhetoric that can be chalked up to FAKE NEWS!! Want to know where the van will be stopping next? Follow us on Facebook and Twitter for an updated itinerary and follow along, and see pics from past visits! We may be on our way to your town next! For weekly updates on all things broadcast, sign up for Direct Current! For more on the tour, check out these items!